A few months ago, we realized that it was time for our not so little baby to have a room of his own. This meant moving big brother into a big boy bed in his new room. Although, this room shift was always in the plans, I was sort of dragging my feet because it meant that we needed furniture for Liam's new room. Luckily, we inherited a twin bed, that my parents no longer had a use for, so that meant all I needed now was a dresser. Naturally, I started shopping around for furniture and was pretty blown away at how expensive crappy furniture is, and on top of it, I just wasn't finding anything that suited our needs. Then, my mom reached out to me and told me that she new someone that was giving away a dresser and asked if I would like to have it? My immediate response was "of course, when can I come see it?" So, we got our hands on a free dresser, it doesn't get better than that! When I finally saw the dresser, I realized it had potential. It met some of the criteria that I was looking for which was a tall dresser, plenty of storage, sturdy, dovetail joints, and in good condition ~ who could ask for more? Naturally, the next step was to decide what to do with it. It was in really good condition, so it wouldn't need a lot of sanding or priming. However, I really disliked the hardware so I knew that had to go. Next thing I decided was that I wanted to go with a casual style, not too mature but also not to babyish - basically, something that Liam could have for awhile. After hanging out with the dresser for a while, I finally decided that I would paint the body grey and dresser drawers a blue-grey. I had a can of Rustoleum Satin Granite in the basement, and I thought that would be great for the body. 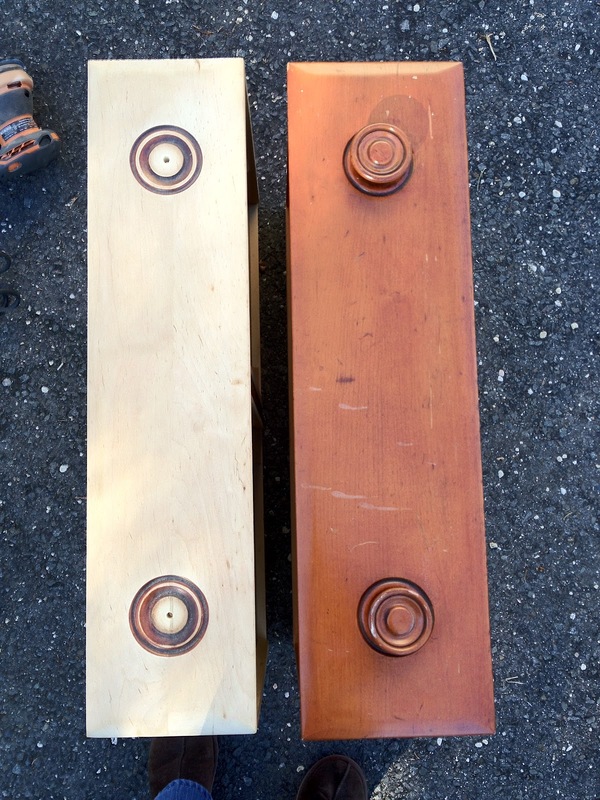 The dresser was in good condition and the Rustoleum spray would go on easy, cover well, and be a practical application for a kids dresser that might get beat up a bit. Now I needed to find the perfect color for the drawers. So, naturally, I started searching Pinterest for some ideas. 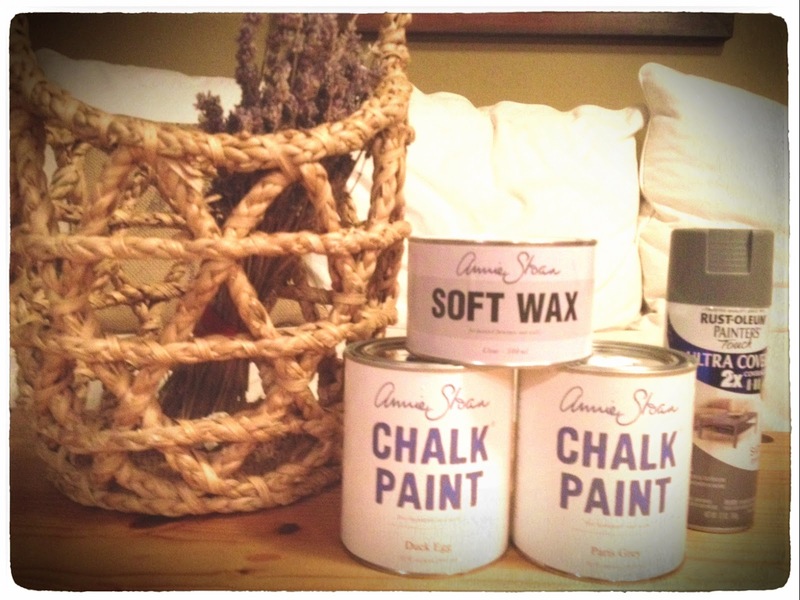 What I found was that people were loving their results with Annie Sloan Chalk Paint and so I went on the hunt to find some. Luckily, we happened to have a distributor near by and I picked up a can of Duck Egg, Paris Grey, soft wax, and the soft wax brush. I got to work on my dresser and covered the body in the satin granite paint. 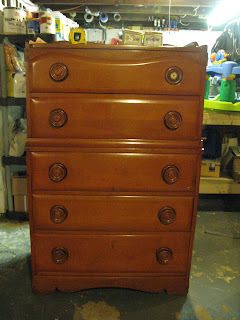 Then I had to sand the drawers and fill the spaces where the hardware once was with wood putty and sand again. Next step was to combine the Duck Egg and Paris Grey paints until I found a combination that I liked, and just start painting. The beauty of Annie Sloan Chalk Paint is that it is very easy to work with and very forgiving. 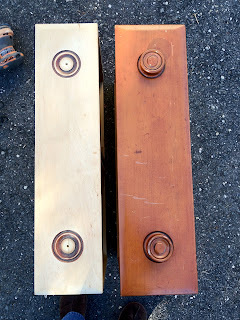 I painted a few coats, just to make sure that the areas where I filled in the wood putty weren't visible anymore. After the paint dried, it was time to cover it with the Annie Sloan Clear Wax. I bought the brush that they suggest and applied a thin coat. I had read that you can't apply too much or it gets cakey and can ruin a piece of furniture. So, I thinly applied and then sanded with my orbital sander and then applied again and sanded again. I gave it some time to really dry before we started installing the hardware. 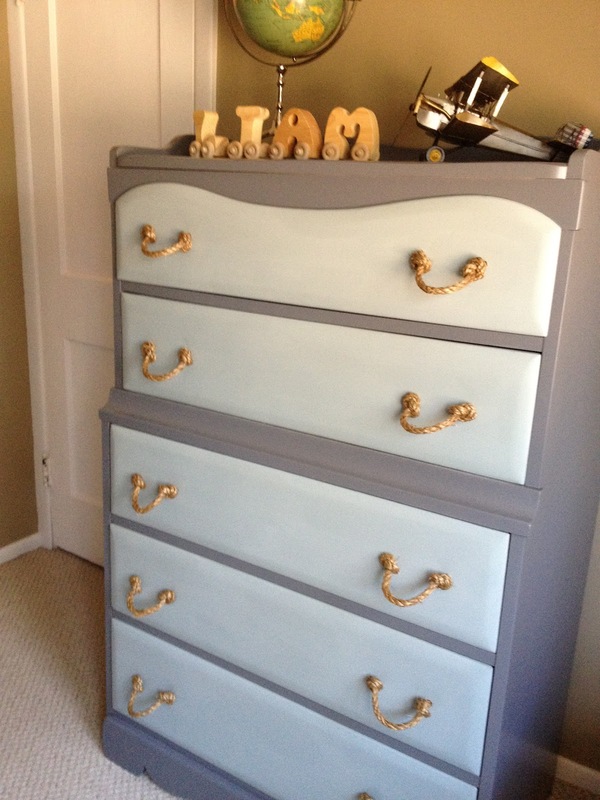 Since I wanted this dresser to have a relaxed feel for my lil' guy's room, I thought rope handles would be really fun. I had a lot of fun renovating this piece of furniture and I'm really happy with the finished piece. We find the dresser is both practical and looks great, too. What do you think? I am a mom to two beautiful boys (3 1/2 and 2 years old), and me, my husband, and our boys all live in lovely Red Bank, NJ. I thoroughly enjoy creating a beautiful home, I am passionate about my family & friends, and simply love to create whether it's designing a room, renovating a piece of furniture, or planning a party . Oh, and I have been having a lot of fun doing it all and hope that this blog of mine will be a great way to document and share some little details about life, my life, our life and all of our adventures and projects along the way.